A 32-member delegation of the Faisalabad Chamber of Commerce and Industry (Pakistan) became the first to cross over to India through the newly raised Integrated Check Post (ICP), whose trial run began today. The delegation will proceed to Delhi to take part in business conclaves and exhibitions there. The Pakistan Government has rejected the visa applications of 455 Sikh devotees, recommended by the SGPC, for visiting Gurdwara Panja Sahib in Hasan Abdal on the occasion of Baisakhi. Undeterred by the fact that the police was looking for them, Moga DSP Balraj Singh Gill and Monica Kapila’s killers- Umesh (23), Harwinder (23) and Pritpal (21)- travelled in the vehicles of the victims for nearly five days after the crime. 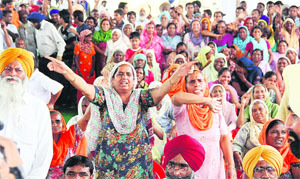 The newly formed SAD-BJP state government may put the brakes on the much-publicised Sangat Darshan programmes. Addressing a gathering during the thanksgiving tour of his home constituency (Lambi), Chief Minister Parkash Singh Badal today said he had directed all government departments to submit a detailed report of their requirements so that a master plan for development could be prepared at the earliest. Even as Chief Minister Parkash Singh Badal today gave in-principle approval to fill all vacant posts of teachers in schools and colleges to ensure their smooth functioning, there is the need of a similar decision to be taken in the healthcare sector. Residents of Jamsher village in Jalandhar district, protesting against a proposed waste-to-energy incineration plant in their area, can now breathe easy. The state-level Expert Appraisal Committee is understood to have written to project consultants that it is not satisfied with the report prepared by them and has sought clarifications. Under fire from his party colleagues, Punjab Congress chief Capt Amarinder Singh seems to have got some respite as the AK Antony led three-member high-powered committee set up by the Congress high command is not expected to give its report till the month-end. And it is unlikely to blame him alone for the poll debacle in the state. He is a folk artiste who rode on his ‘singer for the villagers’ fame to make it to the Vidhan Sabha, beating DS Guru, former Principal Secretary to Chief Minister Parkash Singh Badal. Mohammad Sadiq, who has completed 50 years of singing, is not ready to call it a day yet. He will continue singing, except in his constituency of Bhadaur. Unlike their less-fortunate peers, farmers like Vinod Jyani, Harjant Singh, Gurmail Singh Dhillon, Hartej Singh and Amarjit Sharma are a happy lot. Less than five years ago, they couldn't have imagined that the wheat they are growing would stir demand from the health-conscious section of society. Now, they realise that their decision to adopt organic farming was a step in right direction. Senior authorities of the Punjab Police are apparently trying to protect the erring cops who allegedly tortured a man to death at the CIA-Staff here yesterday. 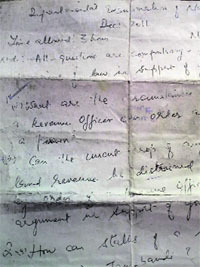 The use of handwritten question papers in departmental promotion examination by the Revenue Department led to an unsavoury situation. Candidates appearing in this exam claimed that as the handwritten question paper was illegible, they could not attempt the paper properly. No VIP treatment is being given to Bibi Jagir Kaur in jail, in violation of the jail manual, said Minister of Jails,Tourism and Culture Sarwan Singh Phillaur while talking to mediapersons here today. Punjab Irrigation Minister Janmeja Singh Sekhon yesterday said the government was serious about tackling the problem of groundwater depletion in the state and was planning to start recharging projects to raise the level of sub-soil water. Representatives of the 7,654 Sanjha Adhyapak Front, Punjab, met Punjab Education Minister Sikander Singh Maluka at his residence and voiced their grievances related to their pending salaries, regularisation of posts and filling of the vacant posts. The Master Cadre Union, Punjab, would raise the immediate release of promotion list and to provide stations of choice to promoted teachers among other issues during a meeting with Education Minister Sikander Singh Malooka on Tuesday. Punjab civil servant Devinder Singh Saroya has a rare distinction to his credit. He has been named as the Chief Executive Officer for the silver jubilee celebrations of the seven zonal cultural centres in the country. Barring one or two intravenous drug users, all others who have been taking Methadone medicine daily as part of their treatment at the Methadone Treatment Centre here, said after taking the medicine for over a month, they were feeling better as during this period they had never taken any drug. The Right to Service (RTS) Act to provide time-bound service is in force in the state for the past four months, but the common man in Moga still faces many hardships in getting his routine work done in the government offices. The administration has set up 104 wheat procurement centres across the district for the convenience of farmers in selling their crop, said Divisional Commissioner SR Ladhar here. About 3,400 beneficiaries of the Shagun Scheme in Bathinda district have not received the payment of Rs 15,000 each from the Welfare Department, Punjab, for the period September 1, 2009 to March 31, 2011. The Punjab and Haryana High Court has directed the state government to complete the Child and Mother Healthcare centre at Peerjain village under the public private partnership or any other mode and take the decision in this regard within four weeks. Leader of the delegationSheikh Abdul Qayum was all praise for the ICP infrastructure at the joint check post (JCP). He said it would prove to be a boon for the growth of trade in times to come. When questioned about the matching infrastructure across the border, he said similar efforts were being made by the Pakistan Government. On the demand of Indian traders that the Pakistan Government should introduce the ‘negative list’ for trade on this route (JCP), as it planned to do in the rest of India, he said the matter needed to be resolved by the Pakistan Government. He said he was aware that there were only 137 items in the ‘positive list’ which could be traded through the JCP while the rest of India had 5,600 items. Sheikh said that his chamber would raise the demand of the Indian business fraternity in his country. He said the trade between the two countries had the potential to erase afflictions like poverty and unemployment in the subcontinent. He said India and Pakistan now had cordial relations after passing through several rough patches. He said one by one confidence-buildimMeasures (CBM) were being taken to give a thrust to trade, social and sports ties between the two. Sheikh said Faisalabad was known as the Manchester of Pakistan and was known for its mass production of textiles. Hence, more than 60 per cent of the delegates were from the textile industry. 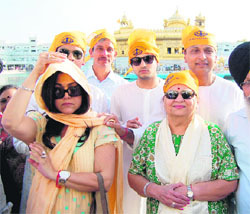 Out of a total of 3,000 devotees, the SGPC had sent a list of 1,575 for the tour. The SGPC president, Avtar Singh Makkar, said the visa refusal was unfortunate and had deeply hurt Sikh sentiments. “This was toatally unexpected. The Pakistan Government has not mentioned any valid reason for denial of visa to these devotees,” he said. It is the third time in the past one year when the Pakistan Government has denied visa to Sikh devotees. In November last, over 500 applications of devotees were rejected. 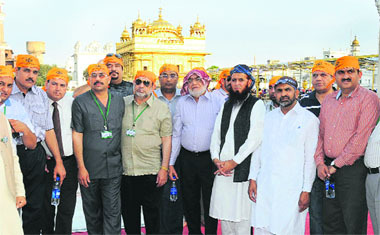 Their names were recommended by the SGPC for a visit to Nankana Sahib. The devotees who have got visas will leave for Pakistan on April 10 through the Attari Wagah joint checkpost and will be back on April 19. The trio used Monica’s Toyota Innova and the DSP’s Chevrolet Optra to attend a wedding and visit shopping malls. They then went to Naina Devi to seek forgiveness for their gory crime. 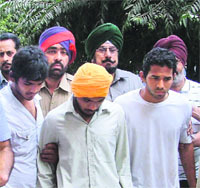 The killers visited Gurdaspur to sell the vehicles but abandoned these after they failed to do so. The killers accomplices, Hasanjit and Ravinder, told the police that following the raids in Hambran, Talwara, Baran Hara and Noorpur Bet , where several youths were rounded up for questioning, Umesh, Harwinder and Pritpal panicked and decided to abandon the stolen vehicles. They went to Balloke village and left the DSP’s Chevrolet Optra there. Then they travelled around the city in Monica’s Innova and abandoned the vehicle at BRS Nagar. They took away the keys of both the vehicles so that the police could not easily tow these away. While the criminals tampered with the number plate of the DSP’s car, they did not change the registration number of Monica’s Innova. Sources said after the police found the abandoned vehicles, it strengthened the suspicion that the killers were living in the vicinity of the farmhouse where the double murder was committed. Dalbir Kaur, sister of Sarabjit Singh, Indian prisoner who has been sent to the gallows in Pakistan, was not allowed to meet Pakistan President Asif Ali Zardari today. Dalbir and her niece Swapandeep, Sarabjit’s daughter, were in Ajmer Sharif since yesterday hoping to meet Pakistan’s President, who paid obeisance at the dargah of Sufi saint Khwaja Moinuddin Chisti, today. 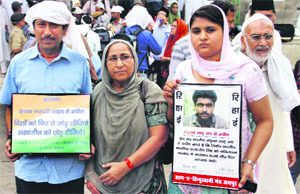 They wanted to make an appeal for Sarabjit’s clemency and had met Ajmer Deputy Commissioner and members of Pakistan President’s advance team in this regard yesterday. Pakistan High Commission officials refused to entertain Dalbir and Swapandeep’s plea to meet the President. However, Dalbir submitted an appeal to Zardari through Deputy Commissioner Manju Rajpal.Talking over the phone, Dalbir said the advance team had assured her of a meeting with the President. But at the eleventh hour she was denied appointment with Zardari. Sarabjit is in a Pakistan jail for the past two decades regarding a bomb explosion. 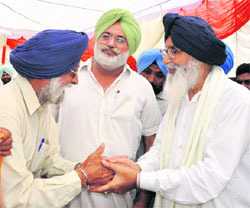 “Then neither me, nor the public would need Sangat Darshan,” said Badal. Elaborating, he said: “Earlier, disbursement of pension cheques was the main problem, especially in rural areas. For that purpose, we have now evolved a system to send pension directly to the beneficiaries through banks. The scheme will be launched on June 1.” The Chief Minister said that the Shagun Scheme would also be covered under the scheme. “In Muktsar district, the ICICI Bank has been assigned this important job,” Badal informed while introducing the bank officials to the public. To another query on the Congress criticism of the state government on the appointment of 21 Chief Parliamentary Secretaries (CPS), the CM said it was in the interest of the state as it would give adequate representation to all communities and areas. The CM’s home district Muktsar, for instance, has several posts of doctors lying vacant. There is only one ultrasound specialist (sonologist) in the entire district having four hospitals at Muktsar, Malout, Gidderbaha and Badal. He, too, is posted at the Civil Hospital, Malout, and as a result the ultrasound machines in the three other civil hospitals are lying unused. In the absence of any specialist in the civil hospitals, patients have to go to private hospitals for getting an ultrasound done. The Civil Hospital in Muktsar also lacks a child specialist, ophthalmologist and a gynecologist. The situation is similar in Malout where four posts of medical officers, of the sanctioned 12, are lying vacant. There is also shortage of paramedical staff, which is affecting the overall functioning. Sources say several objections have been raised regarding the buffer zone in and around the plant, the height of the chimney emanating gases and other public health issues. “An official communication regarding objections raised by the committee is awaited. However, with the kind of objections that have been raised, it may be difficult to get an environmental clearance for the project, unless all issues are resolved, ”said a Punjab official. It is only after getting an NOC at the state level that project developers can seek environmental clearance from the Centre. The Jamsher plant is meant to generate 6 MW of power by burning 700 metric tonnes of municipal solid waste. However, environmentalist and residents say the plant will release various types of harmful gases, posing a serious threat to the lives of residents. “Dioxins-emitting waste burning technology should not be allowed in residential areas,” environmentalist Gopal Krishna says. In Delhi, a refuse derived fuel (RDF)-based plant to produce 20.9 MW power by incinerating 2050 MT of waste at Okhla by Jindal Urban Infrastructure Limited is facing similar opposition from residents and environmentalists. Though this plant has received environmental clearance, but conditions, as per the Environment Impact Assessment Notification, 2006, have been violated. Krishna says studies have shown that Indian garbage's value is approximately 800 kilo calories per kg, mostly bio-degradable and not suitable for plants that generate power by burning waste.“The garbage should have at least 1800 to 2000 kilo calories per kg to yield power, therefore a biological treatment method would be more suitable for Indian waste,” he says. The three-member committee comprising Defence Minister Antony, Delhi Chief Minister Sheila Dikshit and Union Power Minister Sushil Kumar Shinde, is analysing the fault lines in Uttarakhand, UP and Goa. Hence, it has its hands full. “A report is not expected before the end of this month,” a source said. The report is expected to consider the role of the BSP, the 6 per cent vote share of the Punjab’s People Party and the role of Congress rebels in the fray. Even if the committee blames Amarinder Singh, he is likely to be replaced only after another round of intensive discussions. Municipal elections in Punjab and are slated for June. Amarinder Singh’s opponents accuse him of having led the party to a second consequent defeat in the assembly elections and want him removed. Those in his favour want him to stay till the next Lok Sabha elections in 2014. Amarinder Singh reportedly met Congress president Sonia Gandhi and presented her a list of persons raising a banner of revolt against him and those with him. Sources said the two-pronged approach of the Antony committee would be to identify what had gone wrong and to suggest the course for the 2014 parliamentary elections. Sources said one of the key suggestions made by leaders who met Antony in the past three days is early announcement of the party ticket for the parliamentary poll. They say regional parties like the Akali Dal may announce candidates a year ahead of the poll. During its initial round of one-to-one meetings, the committee had invited Ambika Soni, Punjab party affairs incharge Gulchain Singh Charak, Capt Amarinder Singh, Rajinder Kauar Bhattal and AICC secretaries Sanjay Nirupam and Vijay Lakshmi Sadhoo. Nirupam hails from Maharasthra while Sadhoo is from Madhya Pradesh. Congress Legislature Party (CLP) chief Sunil Jakhar and MP Mohinder Singh Kaypee were among those invited. After diligently attending all sessions of the recently concluded Vidhan Sabha, Mohammad Sadiq says he is back to what he does best — singing. “Bina gayan kharcha poora nahi honda (I cannot make ends meet without singing),” he says, adding he has no other source of livelihood. There were people and politicians, including Khanna legislator Gurkirat Singh Kotli, who asked him to give up singing. “But I have no choice”, says Sadiq, who has six daughters. He says he can’t shoulder domestic responsibility on MLA’s salary alone. But Sadiq is clear he will not sing in Bhadaur. “This is something I have declared to my fans”, he says. “ At weddings, people make various kinds of requests after drinking. If I refuse any, they will feel I am acting haughty because I have become a legislator. I want to avoid any such feeling in my constituency”, he explains. Bhardwaj says Sadiq continues to render his popular songs of yesteryear, including his first hit “Nai main chittiyan kaidar nu paavan, jaanda hoya das na gaya’ to his second generation of fans. But that does not mean Sadiq will be away from Bhadaur for long periods. “The Malwa region is his karmbhoomi”, says Bhardwaj. Sadiq, who resides in Ludhiana, has decided to construct a house in Bhadaur to be amid his constituents. At the time when a majority of farmers with 4-5 acres of landholding are under debt and every rabi season, they wait for days at procurement centres to sell their crop, these farmers growing organic wheat are selling their produce at their doorsteps and that too at a price up to Rs 3,000 per quintal. While the MSP of wheat is Rs 1,285 per quintal, the organic produce is already booked at prices between Rs 2,700 and Rs 3,000 per quintal. On his four acres of land, Amarjit has introduced diversification in a big way. He has sown over 20 varieties of crops, including vegetables, fruits, sugarcane, potatoes, onion and pulses, by dividing his farm in small segments. 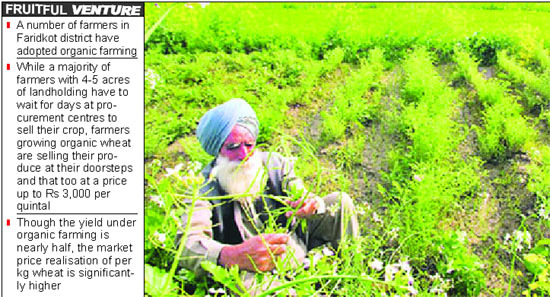 Calling it zero budget natural farming, Vinod Jyani, a farmer with 120 acres under organic farming in Katehra village of Fazilka, says: “In this system, we use those things which are available naturally. Besides savings on fertilisers and pesticides, water required for organic farming is 70 per cent to 80 per cent less than the conventional farming," says Jyani. Cow dung, jaggery and gram flour is used in natural farming. In the first two to three years, the yield falls by 40-50 per cent, but with zero inputs and the produce fetching 100 per cent more price, natural farming brings no loss, says Harjant Singh of Rai Ke Kalan village. A study titled "Economics and Efficiency of Organic Farming vis-à-vis Conventional Farming in India" by the Indian Institute of Management, Ahmadabad, reveals that though the yield under organic farming is nearly half, but the market price realisation of per kg wheat is significantly higher (117 per cent). The study indicates almost 16 per cent higher gross returns per acre of wheat under organic farming over conventional farming, says Umendra Dutt, executive director, Kheti Virsat Mission, a voluntary organisation for promoting natural farming.. The 35-year-old victim, Chamkaur Singh of Khosa Pando village, who had a 'kirana' shop in the village, was picked up by the police on the charges of drug trafficking on Friday evening. He was allegedly tortured, which led to his death the next morning. 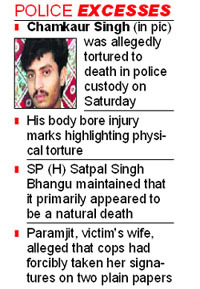 Despite the body bearing injury marks highlighting physical torture, SP (H) Satpal Singh Bhangu maintained that it primarily appeared to be a natural death. He said he was waiting for the report of the inquiry being conducted by a judicial magistrate and the post-mortem report. Till then, he was not in a position to take any action, he added. The probe conducted by CJM Rakesh Gupta is in progress as the victim's wife and brother are yet to record their statements. A parallel inquiry marked to the Dharamkot SDM by District Magistrate Arshdeep Singh Thind is also in progress. Paramjit Kaur, victim's wife, has alleged that some policemen had forcibly taken her signatures on two plain papers, which they could use anyway to save their skin. Another family member alleged that the police was constantly pressurising them to give 'favourable' statements before the CJM and the SDM, saying that they (family members) do not want any legal action. Out of the total 44 kanungos and senior assistants who appeared in this test in December last year, 39 failed to clear the test. For many of these candidates it was their last chance for promotion to naib tehsildar. Besides, the candidates claimed that the question paper was in English language instead of Punjabi. The department conducts the test twice in a year to promote kanungos and senior assistants to the post of naib tehsildar. These exams are conducted by the Director, Land Record Office (DLRO), Jalandhar. The next exam is scheduled for April 17. In a representation to the higher-ups, the kanungos and senior assistants have demanded that this time the question paper should be in Punjabi language and neatly typed. Dilbag Singh, state president, Kanungos' Union, said the union had submitted the request to the DLRO. "Since many kanungos appearing in the test were close to their retirement, they had little knowledge of English language. They should be given another chance". However, a senior DLRO officer said an official being appointed as naib tehsildar was expected to have good knowledge of English language. On handwritten question papers, the officer said four sets of question papers were called from four Divisional Commissioners and any of these sets was selected randomly. Sometimes these question papers were handwritten, he added. The minister said this while on a tour of his Maur constituency. The minister visited villages including Chotian, Bugran, Burj Mansa, Gill Kalan and Kararwala. Sekhon said that the measure was expected to boost irrigation facilities in the state besides solving the problem of drinking water shortage. Speaking while on tour, the minister reiterated that a master plan for irrigation would be chalked out within 90 days and efforts would be made to bring canal irrigation to all agricultural land. Even the uncommanded areas would also be brought under command irrigation, he emphasized. The commanded areas are those that are irrigated using canal water and uncommanded areas are those that do not have access to canal water and are irrigated using other means of irrigation such as tubewell. “For this, the patwaris would visit every village and the villagers can give their applications to the patwaris or respective area irrigation XENs,” he added. Sekhon said his priority was to develop the Maur constituency in the best possible manner. He spoke to the villagers about their problems and directed the officials to redress the grievances. “Various reasons were cited for the delay in the recruitment procedure. Finally, giving some respite to the teachers, appointment of lectures happened in April 2011 and vocational masters in June 2011. Appointments for the rest of the posts were again delayed on one or the other pretext. As a result of this, more than 1,500 appointments are still pending as the waiting list is yet to be taken up by the authorities concerned,” he further added. “Apart from the delay in recruitment, another difference between the two drives is the salary on which the teachers were appointed. While those recruited under the SSA drive were appointed on a monthly salary of Rs 29,000, those recruited through the advertisement were offered Rs 6,400 (lecturers), Rs 5,800 (vocational masters), Rs 5,400 (Master cadre) and Rs 3,300 (non-teaching staff). As the elections neared, the pay was increased to Rs 10,000 per monthly in November 2011,” he further added. “The 7,654 Sanjha Adhyapak Front members had voiced their concerns in a meeting with the Education Minister Sikander Singh Maluka on Friday night. He patiently listened to our demands and assured us that he will take up the matter with the state government and will soon call us for a formal meeting in Chandigarh,” added Mann. Harminder Singh Uppal, district president of the union, here today said that the Education Minister had invited delegations of the different unions to discuss their demands and suggestions to bring in improvement in the working of the education department. "The Department Promotions Committee had cleared the promotion cases of masters as lecturers in December last. But the list has not been released," said Uppal, adding that after the formation of the new government the promotion list of headmasters had been released last Monday, thus raising hopes of teachers aspiring to be promoted as lecturers. The celebrations will start on April 13 at the Sector 5 Parade Ground in Panchkula. Prime Minister Dr Manmohan Singh will be the chief guest, while UPA chairperson Sonia Gandhi will preside over the inaugural ceremony of the four-day celebrations. A Special Secretary in the state civil service cadre, Saroya has been looking after the North Zone Cultural centre, one of the seven zonal cultural centres that were set up between 1985 and 1987 to preserve, promote and disseminate plurality of India's cultural and traditional art. Saroya, who worked as Deputy Principal Secretary to slain Punjab Chief Minister Beant Singh, also served the Chandigarh Administration in various capacities, including the Director of Public Instruction (Schools). He belongs to the select band of state civil service cadre officers to hold the position of the Secretary of a zonal cultural centre. Conventionally, the Governor of the state in which a zonal cultural centre is located, heads that centre. The silver jubilee celebrations will witness more than 2,000 selected artistes, including artisans, craftsmen, folk artistes and dancers from all over the country giving out a flavour of rich cultural heritage of the country. A massive pandal is being set up in the Panchkula Parade Ground for the celebrations. Besides the Prime Minister and the Chairperson of the UPA, Governors of seven states that have zonal cultural centres would also be expected to attend the opening ceremony of the celebrations. Most of the participating artistes, craftsmen and artisans have already arrived and started their rehearsals for one of the biggest cultural festival to be held in this part of the country. They said this to the officials of the United Nations Office on Drugs and Crime (UNODC), New Delhi, and the All India Institute of Medical Sciences (AIIMS), New Delhi, when the teams visited them and interacted with them a couple of days ago at the Methadone Treatment Centre in Bathinda. Those who interacted with the intravenous drug users were Dr Anju Dhawan, additional professor, Psychiatry, AIIMS; Dr Ravindra Rao, a technical expert from UNODC; and project coordinator (Drug use and HIV prevention in South Asia) of UNODC, Kunal Kishore. The centre was opened on February 15 last year under the Methadone Maintenance Treatment Project, for the treatment of the intravenous drug users at the Drug De-addiction Centre, situated on the premises of the local Civil Hospital, here. During the interaction with the officials, many of them also expressed satisfaction over the treatment though one to two persons admitted that they sometimes took drugs when they faced problems in falling asleep. Most of the patients are from Bathinda city while some are from Jassi Pau Wali, a nearby village. A patient said after starting the methadone medicine, he had started doing routine work and taking interest in the family affairs while earlier, he used to remain out of the house for most of the time. He also said he hadn’t taken any injection since his treatment began. Another patient said he was a civil engineer and had been administering injections to himself before visiting this treatment centre. But now, after starting the treatment, he had realised the harmful effects of taking drugs. Two patients said they had been taking drug through injections for the past five to six years, due to which they had been ruining their families, both financially and socially. They claimed they were fine now. One of the patients said after coming to the centre, his respect and honour in the family and society had increased. Besides, he also considered himself to be a physically fit person now. Two patients said after beginning the Methadone treatment, their habit of injecting drugs reduced by 75 per cent. The UNODC and AIIMS officials asked the patients to bring it to the notice of the centre’s authorities so that they could adjust the dose of the medicine according to their individual requirement. However, Kunal Kishore expressed satisfaction over the results of the Methadone Treatment Centre and hoped that when they would visit the centre again, none of the patients would tell them that he was still on drugs. Although application forms for arms licence are available at the Suvidha Centre set up in the Mini-secretariat, the employees there do not give the form until one obtains a written approval from the Deputy Commissioner (DC). Sometimes, it takes days for a common 'illiterate' man to meet the DC. Rajinder Singh, a local resident, downloaded the arms licence form from the district administration's website but the Suvidha Centre employees refused to accept it. They argued that none of the public utility forms available free of cost on the website were accepted by them. One has to pay at least Rs 20 per application form even if it is downloaded from the administration's website. People are also facing bad experiences at the DTO office where a nexus between the contractor/employees of the Suvidha Centre and agents is giving rise to 'widespread corruption'. In the past, the local police had exposed the nexus on a couple of occasions, but it continues to thrive with 'rates of services' increased by the agents. In May 2011, the local police registered a criminal case under Sections 420, 218 and 120-B of the IPC against a clerk and an agent at the DTO office. A similar case was also registered in October 2009 against two employees and some agents. The employees of the DTO office and the Suvidha Centre are reportedly hand-in-glove with the agents. Resultantly, people have to shell out more for registration of vehicle, driving licence and other works. In many cases, the DTO himself got deposited in his office the penalty relating to traffic challans, which were actually sent to the chief judicial magistrate's court, resulting in harassment of offenders. Some offenders even had to pay the fine twice to get their driving licences or registration certificates of vehicles back. Ladhar said that all officials attached with the procurement centres must ensure that farmers get paid in 48 hours. The Divisional Commissioner said that there would not be any storage problem for the wheat crop in the district due to a large number of rice shellers. "We have 400 shellers and storage related preparations have been completed," he stated. For the purpose, the District Welfare Office here has already demanded Rs 5.10 crore from the government, but to no avail so far. When contacted over the phone, District Welfare Officer, Bathinda, Pritam Singh Kore said however, the payment of the Shagun Scheme to the beneficiaries from the district had already been made for the period from April 1, 2011 to November, 2011 while the payment of the scheme to 734 beneficiaries for the period (from December 1, 2011 to March 15, 2012) was yet to be made. He said his office had already sent the cases of these 734 beneficiaries to the Welfare Department at Chandigarh for making the payments online. As per the information, the payment of the Shagun amounts would be made to these beneficiaries by April 15, he added. Kore further said the verification of the beneficiaries of the scheme till March 31, 2010, had already been done. The hospital would benefit residents of nearly 150 surrounding villages. The High Court further directed the Department of Finance to ensure early release of funds for the project so that the hospital becomes operational once the government takes an appropriate decision. The directions were issued by the Bench headed by Chief Justice Ranjan Gogoi on a PIL filed by Fatehgarh Sahib MLA Kuljeet Singh Nagra. The foundation stone of the super specialty hospital at Peerjain, to be constructed at a cost of Rs 7 crore, was laid on December 25, 2005 by the then Chief Minister Capt Amarinder Singh during the Shaheedi Jor Mela, dedicating it to the supreme sacrifice of Mata Gujri and Sahibjadas, who were bricked alive. The construction work had started and approximately Rs 2.5 crore was spent on the project, but as soon as the Parkash Singh Badal government took over, the construction work was stopped and building was handed over to the Punjab Infrastructure Development Board. Kuljeet Singh Nagra filed a PIL urging the High Court to direct the state government to complete the hospital on which nearly Rs 2.5 crore had already been spent and further to direct not to abandon the project halfway.